Kusari toi (sometimes translitered “doi”)—the Japanese characters are 鎖樋 which translates literally as “chain gutters”—are known in English as rain chains. They are used in Japan as downspouts to direct rain from a gutter to the ground, where it either flows into a gravel or pebble bed or into some sort of catchment. 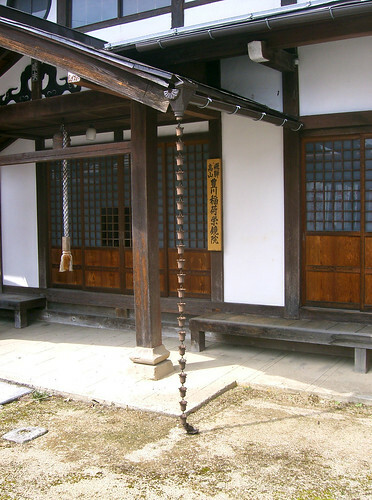 Rain chains are traditional on Japanese houses and temples, but they’re also sometimes seen on midcentury modern houses, not surprising considering the influence of Japanese house design on modernist architecture. And because of their ecological value – they direct water back onto the property, instead of into storm drains – they are becoming more popular on all types of houses. It’s said that their purpose was traditionally largely decorative, but that’s not entirely true, contrary to what many house inspectors think. Chains actually do function perfectly well as downspouts. In my experience in BC, rain chains have usually just been made from simple heavy chain (see my video in the previous post) but they are also sometimes made from a series of metal cups strung at intervals on a chain. (See example in copper, above – note that for some reason this one is missing its catchment.) With the latter type, water overflows each cup and falls to the next, producing the sound of a fountain or brook. In Japanese gardens greater attention is paid to sound, and rain chains are part of that sensitivity. They do make a beautiful sound. I for one really dislike the clumsy ticking of water in metal downspouts. Below is a rain chain at an Eichler house in California. Here the water runs into a traditional Japanese pebble pit. More information here, and see also here and here. And update: see Anna’s rain chain on a traditional heritage NY State house here. You don’t have to have a Japanese or midcentury modern house to have a rain chain. This entry was posted on Wednesday, April 21st, 2010 at 12:59 pm	and is filed under architecture, design, green, landscaping. You can follow any responses to this entry through the RSS 2.0 feed. You can leave a response, or trackback from your own site. Fantastic. Thank you for this lovely detail. Hi. I came across your blog post and wanted to introduce myself. My name is Scott and I own Rain Chains Direct. I sell 16 different styles of high quality yet affordable rain chain designs. We have outfitted many new construction jobs in the last few years. Let me know if I can be of any assistance. I posted photos of my rain chain! Anna, it looks great! Prior to this I thought I preferred a plain chain but the studded copper chain really adds a lot to your front entrance; I love it. I want to see/hear video! 鎖樋 is actually read kusaritoi, not “d”oi. This is according to Rikaichan dictionary, not me. Thanks, Sarah! I found that transliteration on the internet – someone must have been guessing. Do any of you experts have a cure for excessive water falling through the gutter cut out? I have employed the recommended reducer but if the rain is much more than a drizzle, the double linked copper rain chain can not handle the flow and the excess just falls through the hole compromising the elegance of the most attractive sinuous flow down the chain. Is this normal or is there a correction I can make?